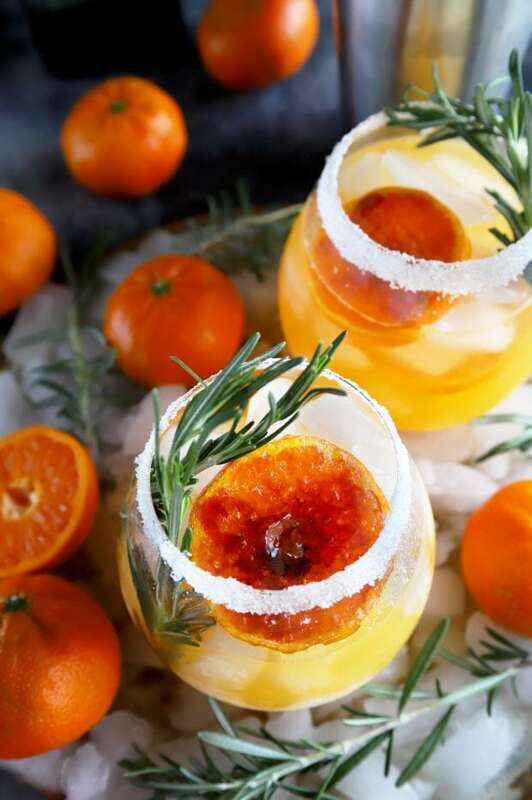 A Clementine Mezcal Margarita is sweet, smoky, and herbaceous, making it a gorgeous sipper for any occasion. 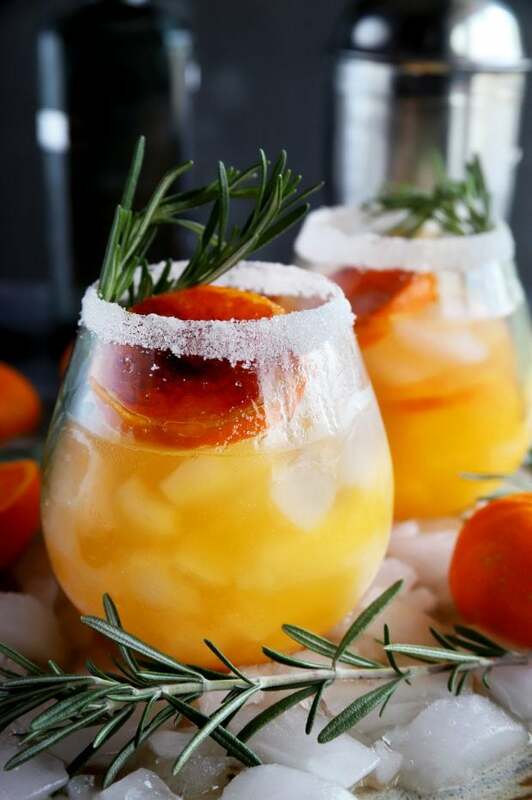 With a homemade rosemary simple syrup and fresh clementine juice, you get tons of flavor sweeping over your taste buds with every sip. It’s deceptively simple to make and oh-so elegant! Well, ok, I wasn’t gone THAT long. However I reallllllly needed a break, so I took it. Honestly, in the last week or so, I kinda lost my mojo. There was a lot of external things going on from drama to new projects, the sun came out and then went away. Anyway, I just felt like I was burning the candle at both ends. Obviously, that’s never a good way to live, is it? So, I took a few days away. I focused on me and what I needed. Let me tell you, it was marvelous. Now I feel like I am back in the saddle again and feeling seriously ready to get back into the kitchen. 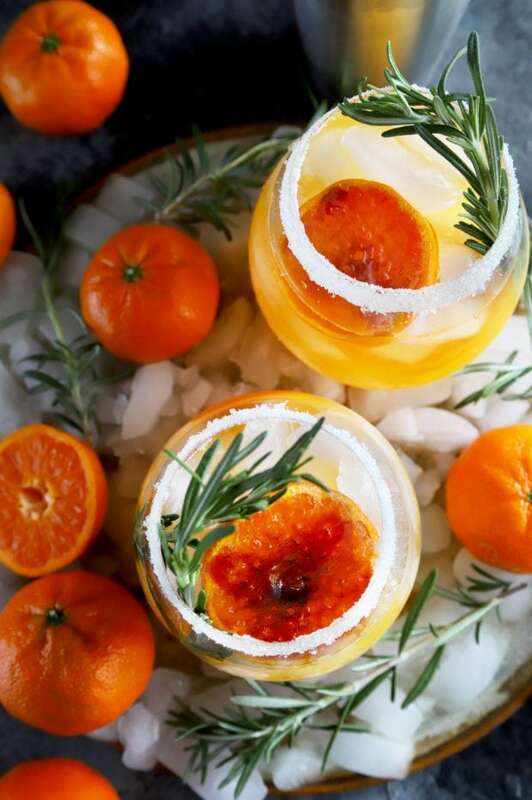 This clementine mezcal margarita is the first recipe I am returning with after this mini-hiatus and it. is. freaking. glorious. 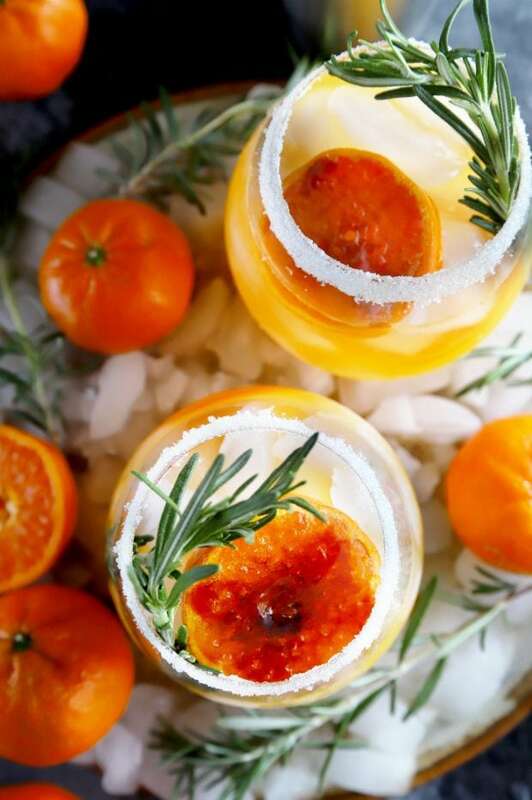 The clementine juice is sweet and tart, melding with the smoky mezcal and the herbaceous rosemary simple syrup in the most soothing way. If I could use one word to describe this cocktail, it would be smooth. Every sip is a delightful layering of flavors, but none of them are particularly overwhelming. Instead they all come together to balance each other out. All I can say is that I LOVE LOVE LOVE this drink. I am literally obsessed with it and I plan to make it at least once a week for the rest of the spring AND summer. It’s particularly perfect for the upcoming Cinco De Mayo celebration you have planned. It pairs perfectly with tacos, burritos, enchiladas, churros, and whatever else you plan to be gobbling up on that day. I mean, just look at that beauty. 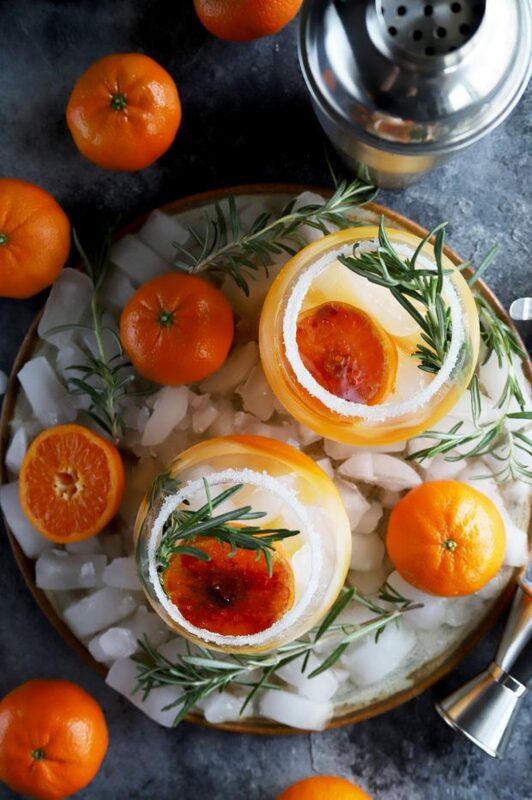 Not to mention the elegant brûléed slice of clementine that comes with it… It’s just the little sweet treat at the end of the cocktail to gobble up and enjoy. 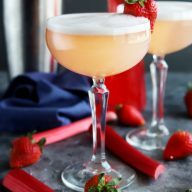 It’s a cocktail, PLUS a sweet treat. All in one gorgeous glass of colorful goodness. Are you ready for one? I know I am! Cheers to the freakin’ weekend… that is ALMOST here. 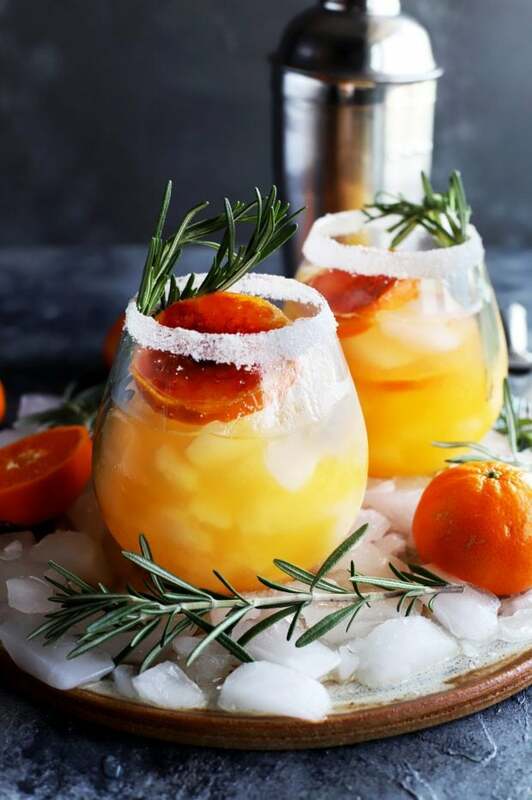 I like to use large wine glasses to serve this cocktail because I think it looks even more gorgeous that it ever would in a standard margarita glass. 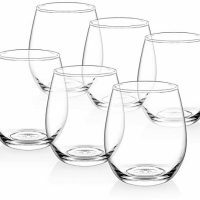 Plus it makes for a bigger, more sturdy glass to hold onto while you shovel tacos into your mouth with the other hand. 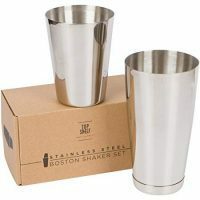 To make this cocktail, I like to use the Boston cocktail shaker. It’s my favorite shaker in my home bar collection. Simple is always best, in my book. 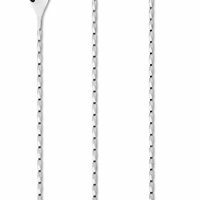 Then you’ll need this set of cocktail stirring spoons to give the cocktail a final stir once you top it off with bubbly club soda. 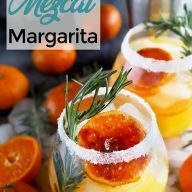 Pin this Clementine Mezcal Margarita recipe for later! Want more margaritas? 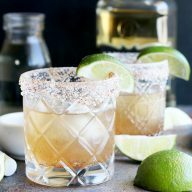 Check out this chili lime margarita, lemon agave margarita, peach blueberry margarita, or the perfect margarita! 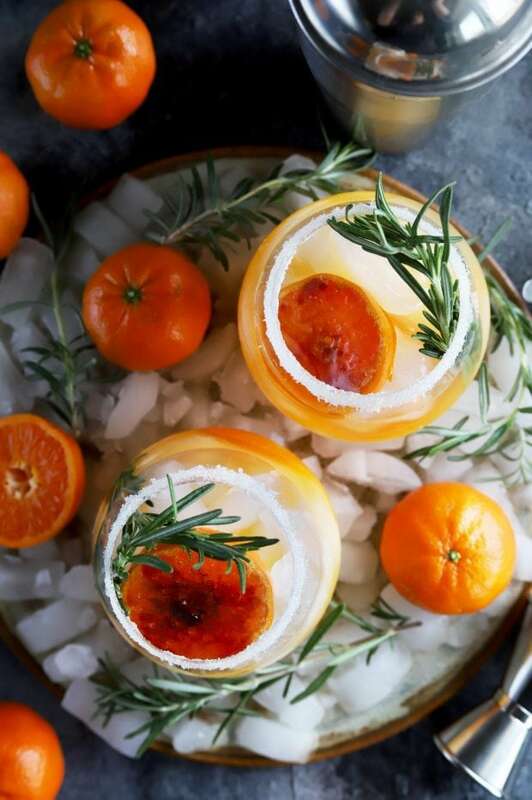 A smoky, sweet, and tangy combination that'll have you celebrating any occasion in style! 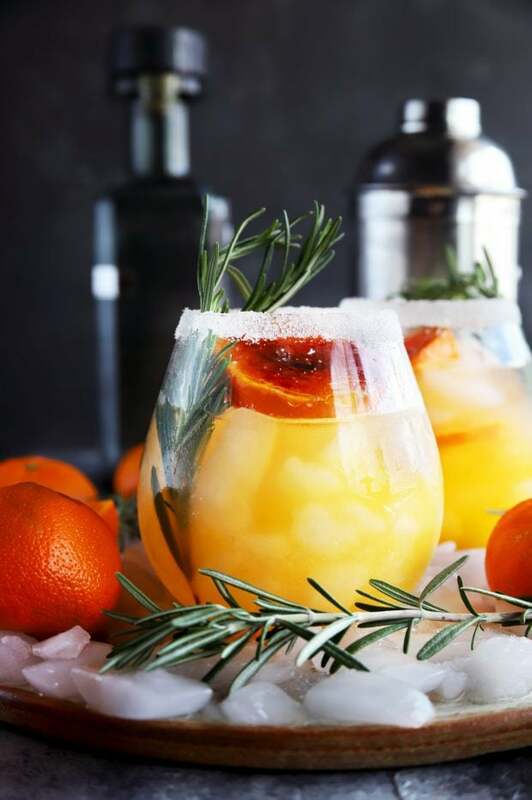 Time to up your cocktail game, my friends. Rim two cocktail glasses with sugar. Set aside. To make the simple syrup, combine all ingredients in a small saucepan. Bring to a boil over high heat, stirring until sugar has dissolved. Remove from heat and cover. Let steep for 15 minutes. 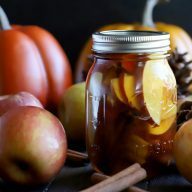 Strain syrup and cool in the refrigerator until ready to use. 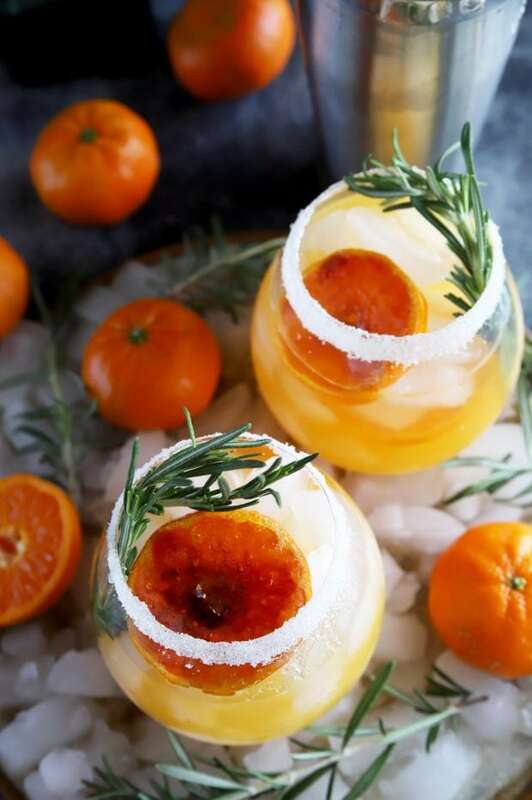 To make the cocktail, add mezcal, lemon juice, clementine juice, and simple syrup to a shaker filled with ice. Shake well. 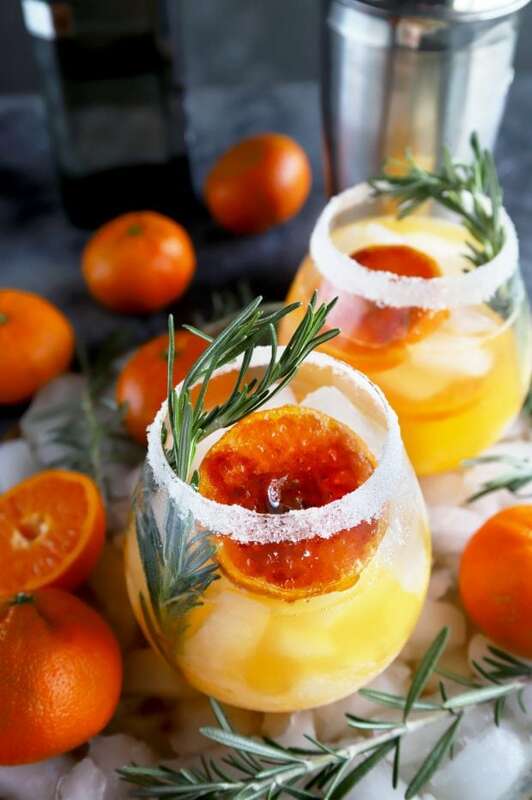 Fill cocktail glasses with ice and strain cocktail into both glasses, dividing evenly. Top with club soda and give a final stir. 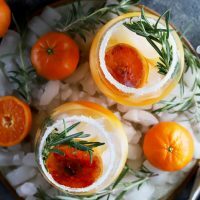 To make the brûléed clementine slices, top each with 1 1/2 tsp sugar. Using a kitchen torch, slowly go back and forth over the slices to melt and brown the sugar. Let set for about 1 minute to let the melted sugar harden. Garnish cocktails with a brûléed clementine slice each and rosemary sprigs. Serve immediately.